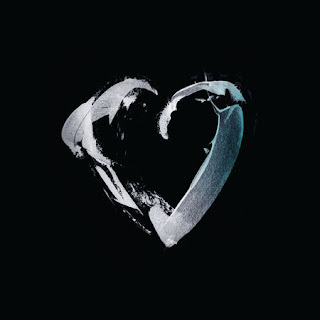 Hunter & The Bear - "Paper Heart"
You Can Talk, the opening track, says it all. It sets the tone insofar, as you know deep down, that you are not going to let it go. You know you are going to listen to the entire album. It is going be solid, cohesive and convey emotions in a way that only a true rock band can deliver. Rightly or wrongly, even if they are British, I cannot help thinking about American bands such as Vertical Horizon, Life House or even Third Eye Blind... Not so much for the music, even though they are probably not that distant from one another. No, what I have in mind in terms of commonality is the integrity, the craftsmanship and the ability to create milestone anthems, nothing less. Hologram and Paper Heart in particular are a great platform for lead singer Will who can display his ability to reach not only the right notes but sings with his heart on his sleeve - literally speaking. The whole being supported by enthusiastic and efficient backing vocals. I like the urgency in Who's Gonna Hear You and I hope for the band that many will get to listen to them and other tunes such as Renegade (tell me if it's a Billy Idol Like Intro) or DRK. The atmospheric I Am What I Am and its slow tempo is a beautiful contained piece of music. Funnily enough I was expecting the track to take off at some point in a very predictible way but it did not and I was taken by surprise by the ending :-). This band, after producing a solid collection of singles in the last 18 months, is slowly becoming one of the most interesting Atlantic (prior Brexit) rock bands of the moment (it's a new genre only known to me :-)). You would be daft (I know you aren't :-))not to be curious enough to investigate any further!!! Overall: I am looking forward to more albums. Live test: Please let me know if they drop by Dublin!!! UK outfit DEMOB HAPPY’s music video for “Dead Dreamers” has just premiered exclusively at EARMILK. “Dead Dreamers”, which EARMILK called a “bouncy jam full of fuzz and thrusting, tight guitar work”, is the newest single to come from the band, distributed through Atlantic Records’ imprint Taste and Tone. The “Muppets gone dark rock”-inspired video for “Dead Dreamers” is sure to gain as much praise as the single itself. NME said “There are hints of ‘Showbiz’-era Muse and pre-stadium Biffy Clyro. 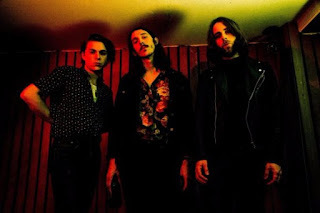 In other words, Demob Happy are rock giants in the making.” The Guardian astutely applauded the band as “a joyride through rock’s sleazier back alleys.” With the fuzzy guitars, bouncing bass, and frontman Matt Marcantonio’s ability to emote the gritty and the pretty aspects of madness and euphoria conveyed in the track. Demob Happy have asserted themselves as an unstoppable sonic force since their inception. From playing basements gigs in their own coffee shop-come-studio HQ, the Nowhere Man Café, sold-out headline shows across the UK and Europe, and appearances at Reading & Leeds, The Great Escape and SXSW, the band makes no plan on stopping their upward trajectory. Looking ahead, Demob Happy are currently working with Tom Dalgety (Pixies, Ghost, Royal Blood) on their upcoming album. Confirmed to support The Cribs across the UK at shows including London’s The Forum on May 18th, Demob Happy will also support Gang Of Youths in May, all dates listed below. Demob Happy is Matt Marcantonio (vocals / bass), Adam Godfrey (guitar / vocals), and Thomas Armstrong (drums / vocals). 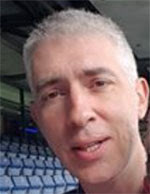 "Dead Dreamers" was produced by Tom Dalgety. Jimmy Lumpkin & The Revival expand their brand of Alabama-based soul rock with the release of their self-titled EP, Jimmy Lumpkin & The Revival, out May 12 on Skate Mountain Records. Jimmy Lumpkin & The Revival are playing the Hangout Music Festival in Gulf Shores, AL on May 19. They will be playing full-band at the Mermaid Stage at 12:30 p.m. local time, and then will have a pop-up acoustic set in the VIP Grove at 4:30 p.m local time. Tickets for Hangout Music Fest are sold out. Jimmy Lumpkin & The Revival showcases the depth and spectrum of emotions and vibes that Lumpkin’s rich, raspy croon is so adept at conveying. On the dynamic “Troubled Soul”, Lumpkin offers a welcoming hand to a traveling loner. Atop soulful, bluesy rock and brass, the vocals astutely characterize the mix of heartfelt sensitivity and earthy grit that is at the core of Jimmy Lumpkin & The Revival. Conversely, “The Best One” offers a more subdued, curated introspective focus of love-gone-by reflection, with Lumpkin’s aching voice complimented by the rise and fall of the organ and the sparse drums. Hailing out of Mobile, Alabama, Jimmy Lumpkin’s music reflects the heart and soul of the man himself: sensitive, passionate, and considerate of the ebbs and flows of life, all types of people, and the world, with southern roots clearly reflected in the shades of soul, Americana, and blues influences found in his brand of rock. A quiet man who loves to spend time at home, in his cabin with his wife, Lumpkin’s uses his music to speak for him. Far from a stereotype or trope of his environment, Lumpkin is one of the most progressive people you’d ever expect to meet from Alabama. A vegetarian and environmentalist, he is passionate about the damage being done to the planet and the life on it. 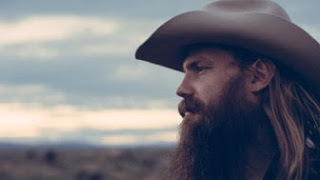 Writing songs at his home just outside of a town rich with Southern history and racial diversity, Lumpkin is acutely aware of the conflicts and injustices going on in the country and is passionate about making a world where all cultures can co-exist peacefully. For his part, Lumpkin translates these passions and feelings into art that brings out the emotions needed to rise above the strife, yet remain resolutely human. Lumpkin is aided in this mission by his talented band, including Duane Betts and the horn section known as The Horn Stars (also known as "Sturgill Simpson's Road Dog Horns"). 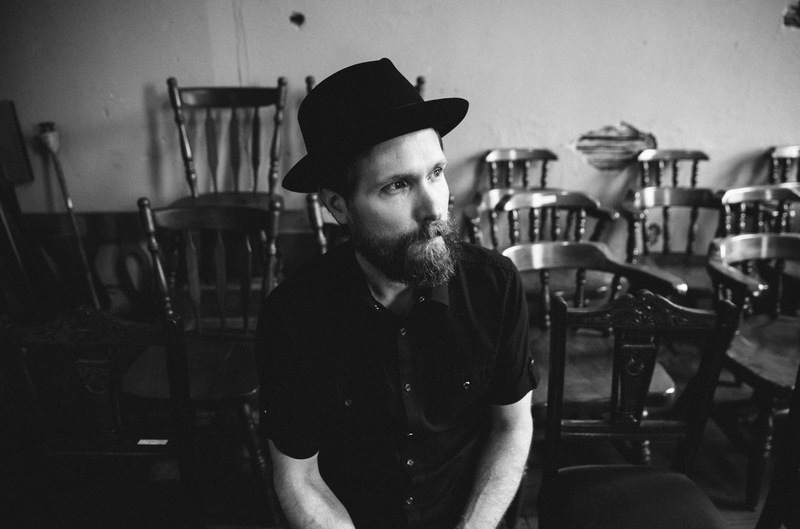 Creating and performing as Jimmy Lumpkin & The Revival, they bring out an array of emotions with Lumpkin’s impassioned voice and lyricism carried hand-in-hand with bluesy guitar, horns, and organ. After performing at Hangout Music Fest, Lumpkin will be embarking on a solo tour in June with Sean Rowe (all dates below). With music made so clearly indicative of the soul and place it derives from, Lumpkin is eager to hit the road with an open heart promising healing and a celebration of all that comes in this life. 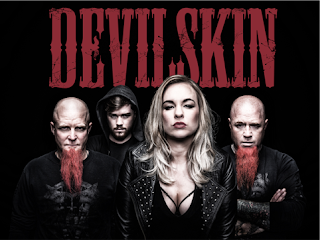 DEVILSKIN following a hugely successful UK tour in March, are proud to announce a pair of intimate shows to coincide with their performance at Download 2017. DEVILSKIN play Ireland with Airbourne before they return to the UK to play the Download Festival on Sunday June 11th at 4pm on the Dogtooth stage, followed by two headline shows in Bridgewater and Bournemouth on June 14th and 15th . Devilskin will be playing songs for their new critically acclaimed new studio album Be Like The River. History recently repeated itself for Devilskin as their new album Be Like The River entered their domestic album chart at #1 on week of release. Just 18 months ago their debut album We Rise spent 3 weeks in the pole position. This is unprecedented in rock music in New Zealand and is a testament to the excellence of Devilskin’s brilliant second studio album Be Like The River. Musically twisted and possessed, catch the fearsome and irresistible Devilskin and be prepared to have your soul shredded. 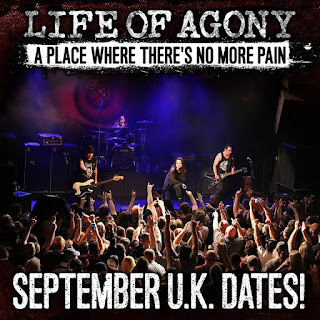 Brooklyn's legendary LIFE OF AGONY have announced a seven date UK tour in September kicking off at Norwich Waterfront on the 15th taking in Manchester, Nottingham, Newcastle, Glasgow, Birmingham and finishing up at The Electric Ballroom in London on the 23rd ! Says bassist Alan Robert: "With the new record finally out and all the excitement surrounding 'A Place Where There's No More Pain' from our friends in the U.K., heading back there this September to play new music is going to be absolutely killer. We haven't visited some of the cities on this run in over a decade... and it's been WAY too long!" 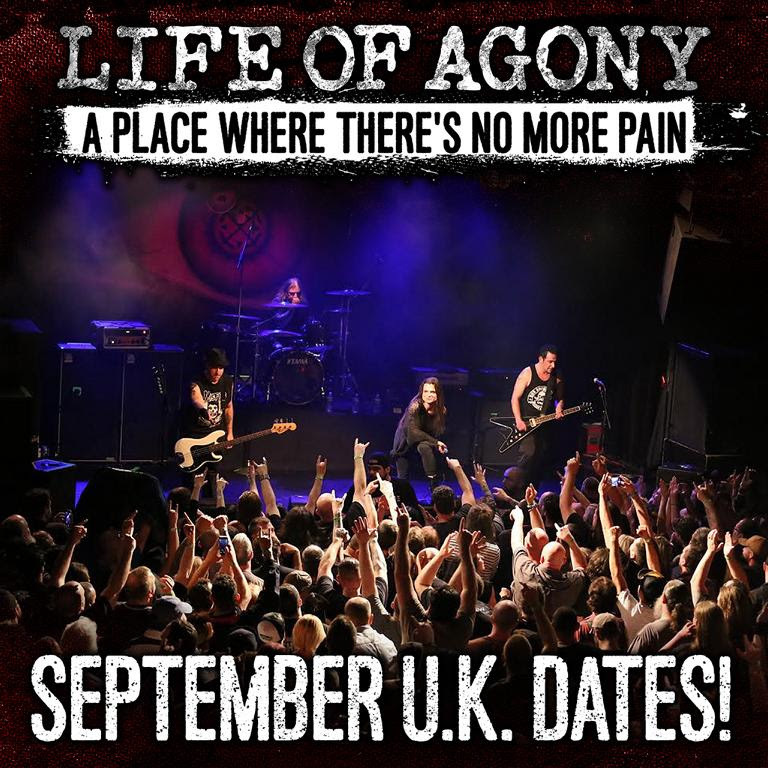 LIFE OF AGONY's 5th studio album, A Place Where There's No More Pain, their first in 12 years was released recently worldwide on Napalm Records to critical acclaim! Produced by Matt Brown & Life Of Agony and mastered by Ted Jensen (Alice in Chains, Machine Head, Deftones), the drive and intensity these ten blistering new tracks possess, surpass all expectations that built up in the past 12 years – a cathartic Sturm & Drang experience for the listener that matches the ferocity of River Runs Red with gut wrenching rock melodies. Raging guitar riffs, heartfelt lyrics and killer grooves mark the return of LOA's signature sound and turn A Place Where There's No More Pain into a passionate, soul-searching affair. LIFE OF AGONY emerged from the New York music scene in the early '90s with one of the most distinctive sounds in its genre. Best known for its 1993 metal/crossover debut River Runs Red, the band instantly built a die-hard, cult following. For over two decades, the group toured relentlessly all over the world, sharing stages with the biggest names in rock, including Metallica, Black Sabbath, Ozzy Osbourne, Foo Fighters, and The Red Hot Chili Peppers. After the much-praised Ugly (1995), LIFE OF AGONY opted for a highly energetic alternative rock approach on Soul Searching Sun (1997) and Broken Valley (2005) – the latter produced by Greg Fidelman (Slipknot, Metallica). LIFE OF AGONY has sold over one million albums to date. RIDGIT MENDLER'S music video for “Can’t Bring This Down” offers a colorful, laid-back energy perfect for riding the warm weather of Spring into the shine of Summer. Logging in at over 1 million streams on Spotify and Youtube combined, “Can’t Bring This Down” is sure to grow more popular with the release of this music video, directed by Vladimir Sepetov. Featuring guest vocals and appearance from rising MC Pell, along with trippy, kaleidoscope-esque visuals, this video parallels the easing, endearing spirit and lush vocals Bridgit brings to the track. Bridgit told Paper Magazine: "This video was so simple but it captures the disorienting effect of your emotions. With Pell and me in this video, you can't tell which way is down. When you fall for someone, you fall upwards into an emotional high. It was easy and fun to shoot this video because when I work with Pell, he is always game to try out ideas. It makes creativity boundless." Pell waxed on the creative process saying, "I love working with Bridgit because it feels effortless when we create. The song reminds me of how good it can feel when you don't hold down your feelings, and also how fun it can be giving into them." WATCH VIDEO HERE: BRIDGIT MENDLER "Can't Bring This Down"
“Can’t Bring This Down” conveys the pleasant etherizing momentum of a new love interest, and the music video embodies that sweeping excitement. 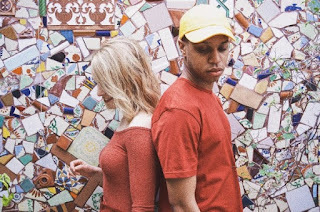 Bridgit’s dynamic vocal range offers a variety of tones throughout the track - from soaring, crooning choruses to sultry R&B-influenced verses, perfectly blended the airy and the palpable parts of joyful new beginnings. The subtle, pulsing drum-and-bass beat of the hook and the finger snaps of the verses wrap around helping to emphasize how Bridgit and Pell’s voices complement each other, creating a pop hit that sways with a soft intimacy. Described by Noisey as a “crossroads between Imogen Heap and early Purity Ring”, Bridgit has been building her career independently and consistently, evolving from her pop-oriented origins and honing her own sound influenced by artists such as Lauryn Hill. Her effortless combination of silky pop verses with edgy soul and R&B-tinged choruses create beautiful harmonies and show off her impressive vocal range. Amassing a social media following that amounts to millions across multiple platforms (7.7 million likes on Facebook; 4.78 million on Twitter; 1.5 million on Instagram), Bridgit has clearly built a well-earned fanbase. Her single "Atlantis" (her first since the release of debut album, 2012's Hello My Name Is...) scored a highly coveted spot on Stereogum's "Top 40 Pop Songs of 2016" as well as positions on top Spotify playlists including New Music Friday, Workout, Young & Free, among others. Establishing her firm hold on the mainstream, the track received over 1 million total plays on Spotify, SoundCloud, YouTube, and Apple Music on release and reached #1 on Hype Machine's Popular Chart and #2 on Spotify's Global Viral Chart. Like the previous single, "Atlantis", the stunning follow-up “Do You Miss Me At All” premiered on Noisey, followed by the music video’s premiere on Pigeons & Planes, who labeled the song a “simmering breakup track.” Taken from her Nemesis EP, "Do You Miss Me At All" hit #2 on Spotify’s Viral Chart and #1 on Hype Machine, garnering more than 7 million combined streams and receiving international critical acclaim, exponentially building her momentum and setting the stage for the aforementioned astounding debut of "Can't Bring This Down."